GAINESVILLE, Fla. (AP) Florida's home finale against South Carolina could be an awkward affair. 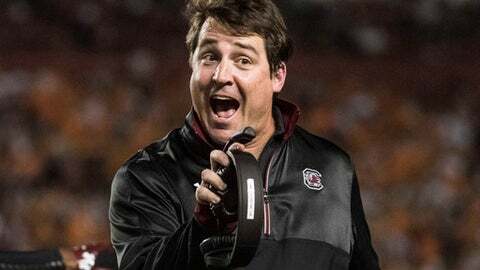 Not only is former Gators coach Will Muschamp returning to the school that fired him just two years ago, but the first-year Gamecocks coach will be in the stadium for Florida's ''Senior Day,'' when most of the players honored will be guys Muschamp recruited to Gainesville. And if the banged-up and 22nd-ranked Gators struggle again – they were noncompetitive in a 31-10 loss at Arkansas last week – Muschamp surely won't be the target of the home crowd's angst. It also could be costly for the Gators (6-2, 4-2 Southeastern Conference). Florida leads the SEC's Eastern Division and could clinch a spot in the league's title game in Atlanta with a victory Saturday coupled with Kentucky beating Tennessee. If the Gators falter against the Gamecocks (5-4, 3-4), who have won three in a row, they also could lose control of the division race. So Muschamp has a chance to spoil his former team's season. Even crazier, the Gators are essentially paying him to do it. As part of his buyout at Florida, Muschamp got a $3.15 million payment following his termination on Nov. 16, 2014. The deal also included four annual payments of $787,500 on the anniversary of his firing. The second installment is due next week. Less than a month after he was fired, Muschamp landed at Auburn as defensive coordinator and started recruited against the Gators. Florida was seemingly so frustrated by the situation that it added a ''Muschamp Clause'' to coach Jim McElwain's contract, which gives the Gators some financial protected if they fire McElwain without cause and he takes a job with another SEC school within 90 days. Muschamp has downplayed his return this week, declining to dissect his four years at Florida or offering insight into what it might feel like to be on the visiting sideline. Being a visitor in the Swamp probably won't be as daunting as it once was, especially given Florida's mounting injuries . Quarterback Luke Del Rio, who threw six interceptions in his last three games, is sidelined indefinitely with a right shoulder injury. Center Cam Dillard is out for the season with a knee injury, forcing the Gators to shuffle a line that has little depth. And maybe more troubling, Florida will be without its top two tacklers. Defensive leader Jarrad Davis (ankle) will miss his first game in nearly two years and fellow senior linebacker Alex Anzalone (arm) is out for the season. APPLEBY IN: Purdue transfer Austin Appleby will make his third start in place of Del Rio. But McElwain said he's ''not afraid'' to play freshman Feleipe Franks. Appleby threw for 440 yards, with three touchdowns and an interception, in his two previous starts. YOUNG GAMECOCKS: South Carolina's second-half surge has been led by its youngest players. Freshman quarterback Jake Bentley is 3-0 as a starter. Freshman Rico Dowdle had a career-high 127 yards rushing in a win against Tennessee. And Bryan Edwards, another first-year player, has 11 receptions for 130 yards and two touchdowns in the past three victories. DEFENSIVE TOUCH: Muschamp clearly has not lost his defensive touch. The man who molded Florida's current defense during his four seasons in Gainesville has had a similar impact on South Carolina. The Gamecocks are fifth in SEC scoring defense and sixth in total defense, improvements from a year ago.